For most people who are overweight, shedding those excess pounds can be extremely difficult. Many overweight people go from diet to diet experiencing little success. One thing that most healthy diet plans advocate is the consumption of low calorie green vegetables to aid your health and help you lose weight. However, forcing yourself to eat a good quantity of green vegetables is difficult for many people. So a green juice diet to lose weight may actually improve your health, curb hunger pangs, and actually help you to achieve your weight loss goals. 1 What is Green Juice? 4 Is Green Juice Good For Detoxification? Green juice is juice that is made up mainly of green vegetables and green herbs and is green in color. However, because juice made up entirely of green vegetables can be bitter and in many cases unpalatable. 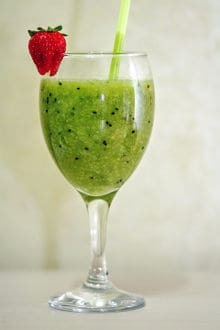 So most green juices do contain other vegetables or fruits to brighten the taste and reduce some of the bitterness. In addition, green juice does not have to consumed all on it’s own. People who are familiar with raw juices recommend that you actually only add 25% of green juice to other juices you make. For example, if you are making an 8 ounce glass of tomato juice, only fill the glass ¾ full of tomato juice and another ¼ glass of green juice. This allows you to have the benefits of green juice without the bitter taste. Any amount of green juice is going to have health benefits, and different experts recommend that you drink different amounts of juice a day. 1-8 ounce glass of juice will actually give you the daily recommended amount of vegetables for an entire day. Vitamin and Minerals Your Family needs- Green vegetables, especially green leafy vegetables contains vitamins and minerals that other foods don’t have and your body needs. Additional fiber- Fiber helps aid digestion, prevents constipation, and helps you to feel full longer which may mean you will eat less. Rich in Anti-oxidants- Green juice is rich in anti-oxidants which helps to fight free radicals which can cause various diseases from premature aging to cancer. Weight Loss- Green juice is extremely low in calories (depending on what other ingredients you add) and can be an aid in losing weight when used in conjunction with a healthy weight loss plan and exercise. If you want to make green juice to lose weight, you need to purchase a good juicer and raw juice your green vegetables and mix them with other low calorie vegetables or small amounts of low calorie fruits and make the juice fresh yourself. Don’t buy those green juices that are sold in the store as these juices often have added sodium and even sweeteners that can make you retain water weight, or add unnecessary calories. You should also avoid making green smoothies that call for sweeteners or other calorie laden ingredients. Is Green Juice Good For Detoxification? Green juice is an excellent way to remove toxins from your body. The Chlorophyll in green vegetables helps to reduce the amount of acids in the body. It also helps to remove toxins from the body that can build up and cause low level inflammation as well other heath problems. Some people use green juice to detox by juicing for 3 days or so, and other drink green juice in the morning and eat lightly throughout the rest of the day. If you are drinking green juice daily, you are likely detoxing on a daily basis, unless your diet is filled with processed foods that may be adding toxins faster than can be removed. You may think that any green juice recipe is healthy, but that really isn’t true. Some green juices contained large amounts of ingredients that are high in calories such as grapes, or other high calorie fruits, added sugars, or high amounts of sodium. The best healthy green juice recipes for weight loss are those that are high in vitamins and minerals and low in calories. Here are three healthy green juice recipes that will help you to lose weight. This apple/kale green juice is loaded with fiber and the apples help to add a small amount of natural sweetness that will make your green juice taste less bitter. You can also substitute a couple of slices of fresh pineapple for the apples if you choose. 2 cored green apples cut in half. 4 stalks of celery with all the leaves removed. 1 cucumber with or without peel. 6 medium to large kale leaves. Some people also add a small peeled lemon or lime to this juice, or a large carrot simply to increase the nutritional value. Spinach is rich in vitamins and minerals and is especially a good source of iron. The recipe is simple to make and most people like the taste. ½ of a peeled lemon. 2 medium pears, peeled with seeds removed (pears will process better if cut into quarters). 6 stalks of celery with the leaves removed. For those of you who are new to green juicing this simple and refreshing apple/cucumber juice is a tasteful way to break you in to green juicing. 1 peeled and cored fuji apple. 1 small handful of fresh mint (you can substitute a 1/8 or ¼ teaspoon of mint extract). Do keep in mind that a green juice diet, is not based solely on the consumption of green juice. The green juice is to become part of a healthy weight loss program. Try substituting green juice for those those high calorie snacks, or drinking four ounces of juice 12 to 20 minutes before dinner to help you eat less and get the fiber, vitamins and minerals you need.